If Mother Nature has taught me anything, it is that success cannot be rushed. Life happens at its own pace. It is up to us to try not to force it through commitments, deadlines, and expectations. Sometimes all we can do is our best, with what we have to work with. Such as I am at this moment. I find myself riding in the back of the vehicle with two kids, who are happily enjoying their snacks. My husband is giving his mother the grand tour of small town North Dakota. For the moment we are in Harvey. I admire the gardens that we pass by- gauging the height of the corn, the weight of the peppers on the plant, and color and ripeness of tomatoes. I am reminded of a request by the new local foods marketing specialist at the North Dakota Department of Agriculture to participate in the Specialty Crop Blog Challenge. I am a bit delayed, just as so many things have been this growing season. 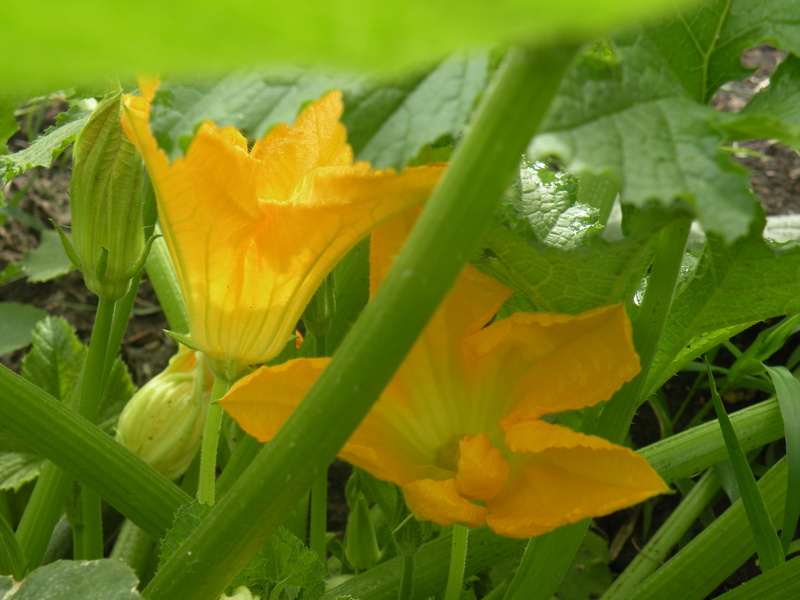 July’s challenge topic was Zucchini, perhaps one the most prolific specialty crops. In fact, if I ever met any one who made a career of growing this green summer squash, I might question their sanity. But then again here I am, tucked in the backseat, writing my July assignment in August on my iPhone… so feel free to question my sanity as well. 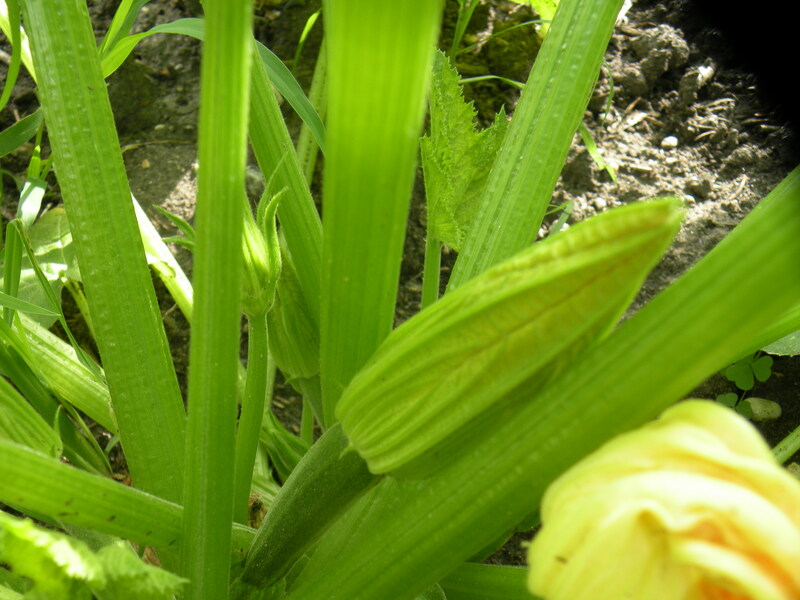 But for the common vegetable grower zucchini is like a promise, never to be broken. There will be an abundance. At this time of year, abundance can come in the form of boxes of bounty, jars of pickles, and loaves of bread. It is a time of year that takes me back to my childhood– back to my grandparents’ garden. Their garden was one of my happy places as a child. I was always at peace there, comfortable in the scent of dill and tomato plants. Delighted by the textures of concord grapes, the sounds of the birds, the abundance all around. 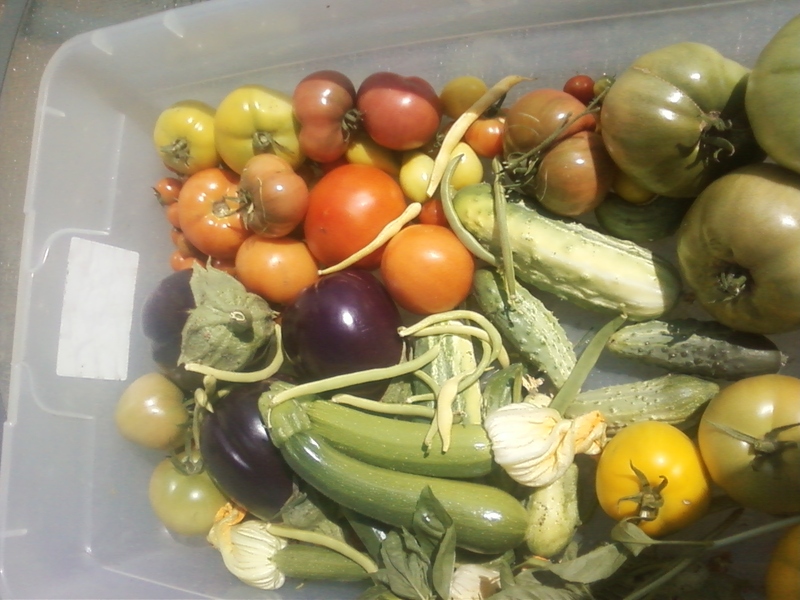 My grandparents never let me leave their home without a box of tomatoes, and cucumbers, and of course, zucchini. When I have the opportunity to visit now, I still seek out the garden, even though Grandpa isn’t there to make sure I notice the radishes and keep me from stepping on the beans. Also, I seek out the stories. My grandmother is a wonderful storyteller, even though she sometimes gets a little distracted. Seeing as I live more than 1000 miles away, I more often opt to hear her stories over the telephone. Our conversations are sometimes scattered, working in bits about children, chickens, and gardens in such away that I can’t help but smile. We discuss the garlic and the chard. I tell her about the rhubarb festival we went to. She is so surprised that my youngest loved the rhubarb. 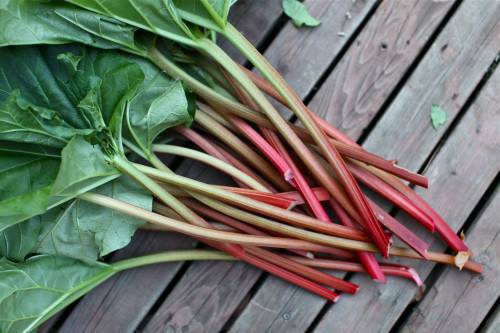 And she tells stories about how when she and grandpa were poor and living in Montana, that they would always be on the look out for rhubarb along the roadside that they could harvest. It is hard to believe they once lived in a time when food was scarce. As they started to build their home and raise their family, having a garden meant something entirely different than it does to me now. I have a garden by choice. Because it keeps me grounded. Because I like growing my own food. My grandparents grew a garden so they could eat. But even with scarcity, they never ceased to be generous. Three years ago when I began growing my garden, I had such a bounty of everything– corn, potatoes, eggplant, basil, tomatoes, and squash. I wanted to waste nothing, but was up to my ears in everything. I began to take a preventive approach, especially with the zucchini. The tricky thing about this squash is the more you pick it, the more it produces. It is all too easy to bite off more than one can chew. But rather than let the fruits grow to monstrous sizes, I began harvesting the blossoms. I had read about fried zucchini blossoms in many cookbooks and often thought them to be a fine culinary pursuit. I selected both male (above) and female (below) because at this point, I wanted to prevent more zucchini from coming on. We stuffed the blossoms with mozzarella cheese and basil. Then dipped them in a batter and fried them. The result was amazing! 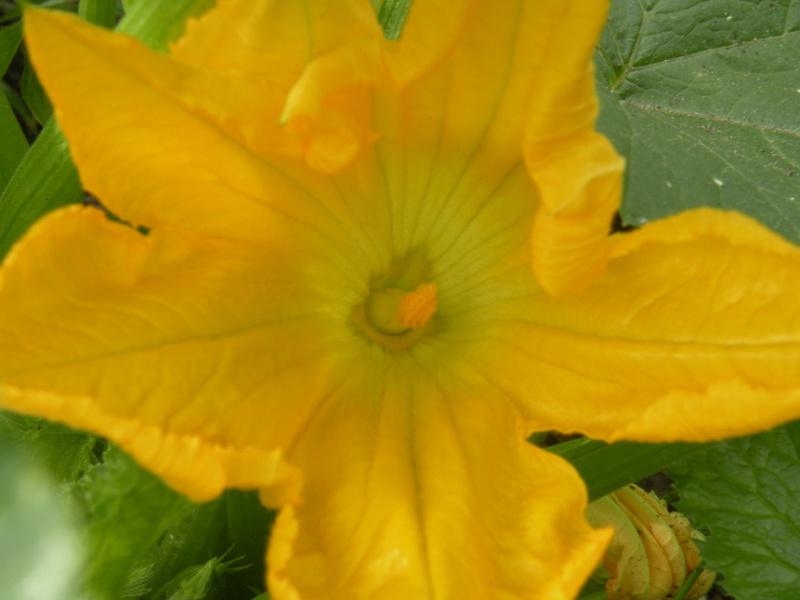 Now long ago, before your daddy was even born, I think, we had zucchini blossoms deep-fried. Your grandpa and I had been building the house. It was early in the summer and we had planted a small garden, but of course we didn’t have much time to tend to it. We wanted to get the house done before the winter. So we were busy and all. I think we had planted some zucchini and tomatoes, and maybe some potatoes. Things that wouldn’t need much attention. Well one day we got notice that the new pastor for the church was coming into town. At that time, your grandpa had been delivering the sermons and doing much of the work. So the pastor was going to come visit us before he got settled in. And remember, in those times we were poor, but it was early in the summer and we didn’t have much in the garden. And of course we had some of the staples in the pantry. So I hurried out to the garden to see what I could find. The zucchini were blooming, but the fruit had not yet set. So I harvested the blossoms and served this new pastor fried zucchini blossoms. He thought they were the most wonderful thing. He was from Chicago and hadn’t had anything like that before. Oh my, he loved them. And you know, years later when he moved on, when he delivered his final sermon, those zucchini blossoms were still on his mind. He thanked us for our hospitality and the wonderful meal. I think of this story often and how much it reflects our perspective of abundance, and our ability to make the most out of what we have. Whether we have too much, or not enough– there is always something we can offer the world. Posted in Appreciating the Moment, Cultivating the Soul, Nurturing Nature and tagged family, food, garden, Local Foods, memories, north dakota, Summer. Bookmark the permalink. Hi, thanks for stopping by my blog…I just read through this post and had to laugh. I am the world’s specialist in NOT being able to grow zucchini. Have been planting them for years and not having any luck. I end up with all male flowers, or the plants die or….The year with 21 plants? A harvest of 4 zucchini. Yup, I’m that good. This year I finally have some, a variety called Ronde de Nice. Of course it may just be the freakish weather we’ve had and not really my zucchini-luck changing.